Arnisgear.com: Check Out Our 30 Day Satisfaction Guarantee! "4 Stick, 1 Inch Pro-Pack"
This is a pack of 4 rattan sticks, skin on, unburned. They are 28 inches long and about 1 inch in diameter. We buy large bundles of rattan, and hand-sort out the pieces that are unsuitable for you as an FMA practitioner due to disease or poor harvesting. We then stress test the remainder using the knee method described below to check them for strength and soundness. You have our best guess for a stick that has reasonable longevity. Our 30 Day satisfaction guarantee does not apply to the longevity of rattan, as we have no idea of what you are going to do with it or how you personally are going to use it. Node requests are accepted, but we may not be able to meet your node number. Rattan is a natural product and the nodes vary dramatically by harvest. Rattan is a dense, fibrous vine with a hard, external skin. The vine is flexible and gives modestly under blows. With repeated impact, the skin will first break down and the fibers of the cane itself will start to slowly emerge. 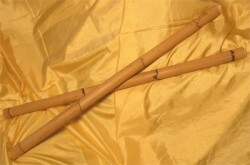 The skin can start to rupture almost immediately, but the integrity of the cane shouldn't be compromised. Cane that has ruptured can be used after wrapping with electrical tape, up until the point the cane "turns to grass." In other words, until the fibers of the cane have separated and gained a broom-like quality. You, the user, can safety test your cane by placing it over your thigh and pushing it downward with moderate force (large people can break a strong piece of even healthy rattan this way). If you hear the fibers breaking, this cane has become unsafe and needs to be replaced. It will break in practice. Much of the commercially available rattan has been sanded to eliminate the appearance of imperfections. Some of it is forced through a cutting die to make the width uniform. Either of these methods reduces the longevity of rattan, if the rattan is used to hit other pieces of rattan. If you are simply twirling or doing solo work, such sticks are fine for you. They are also great, if you are a collector and want to wall mount your sticks or put them in a rack over your fireplace. If you are doing partner work, your bastons are going to fail very quickly without the skins. Canes are traditionally burned with patterns to harden the skin. The skin will last noticeably longer and keep the cane from going to grass much longer as a result. Keep in mind that the cane is flammable, and that burning by the use of propane torch or stove top has a significant fire risk to it. With some modest practice, very elaborate patterns can be created that will really snazzy up your training tool. This practice should not be attempted by minors. Don't burn down your house! Grip the stick like you would make a fist. Both the fist and wrist should remain loose, but not floppy. You should grip it near one of the tips, and leave between 3 and 6 inches coming out the pinky side of your fist. A stub will be formed called the punyo. It is a potent close quarter weapon, and is used in many disarms. Copyright 2007, 2008, 2009, 2010 Water Mountain Martial Society. All rights reserved.